Version 2 of the Arduino Extreme uses a gridded ground plane and includes the new "www.arduino.cc" URL. The Arduino Extreme uses many more surface mount components than previous USB Arduino boards and comes with female pin headers. It also has RX and TX LEDs that indicate when data is being sent to or from the board. The Arduino USB was the first board labelled "Arduino". These were mainly sold unassembled as kits. The first version had an incorrect pinout for the USB connector and had the URL "www.potemkin.org". The Arduino BT is a microcontroller board originally was based on the ATmega168, but now is supplied with the 328, and the Bluegiga WT11 bluetooth module. It supports wireless serial communication over bluetooth (but is not compatible with Bluetooth headsets or other audio devices). A revised version of the serial board with the URL "arduino.berlios.de". The initial design of the single-sided board (labeled version 2 because it was derived from v. 2 of the serial board). Requires six bridges. Has a 1K resistor (but no LED) on pin 13. The ICSP header location is not compatible with other boards. The original Arduino Mega has an ATmega1280 and an FTDI USB-to-serial chip. 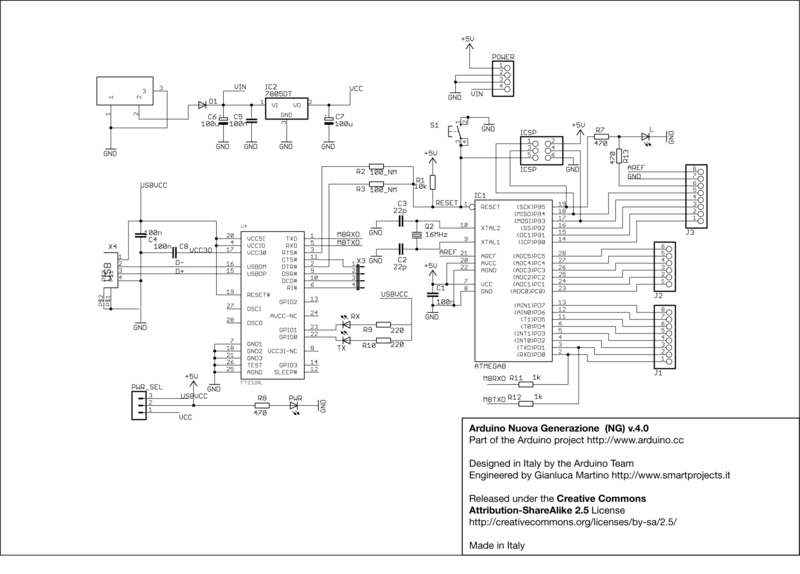 This revision uses the ATmega328P instead of the ATmega168V. All other detials are identical to version 03. This revision has a 6-pin programming header that's compatible with FTDI USB cables and the Sparkfun FTDI Basic Breakout. It adds support for automatic reset, allowing sketches to be uploaded without pressing the reset button on the board. The header is surface mounted, meaning that the board has no pokey bits sticking out the back. In the first revision of the LilyPad Arduino the 10-pin ICSP header was changed to a 6-pin ICSP header and a four pin header w/ RX, TX, +5V, and GND was added. The initial design of the Arduino LilyPad had a 10-pin ICSP header and used the internal clock on the ATmega168 rather than an external oscillator. The bootloader on the initial design is the traditional NG bootloader. The Arduino Nano 3.0 has an ATmega328 and a two-layer PCB. The power LED moved to the top of the board. The Arduino Nano 2.x boards have an ATmega168 and a four-layer PCB. On this version of the Arduino Mini, two of the pins changed. The third pin became reset (instead of ground) and fourth pin became ground (instead of being unconnected). These boards are labelled "Mini 04". On this board, a solder point for digital pin 7 was added to the edge of the board (next to the solder points for TX, RX, +5V, and Ground). Each of the pins is numbered and the board is labelled "Mini 03". The initial production version of the Arduino Mini was labelled "Stamp 02". This version of the Mini USB Adapter breaks out many more pins of the FTDI USB-to-serial chip. It is labeled "USB Mini 03". The original Mini USB Adapter was labelled "Arduino Stamp 02".